Welcome to the “Sea Change” Innovation Lounge! Located outside the main auditorium, the I.Lounge is a place to interact with some of our presenters and their projects, view the day’s livestream, relax, and meet new people. What are you waiting for?! theBlu will allow you to explore and experience a beautiful online 3D underwater world. It is an interactive, crowdsourced ocean screensaver that just won the 2012 SXSW Accelerator Award. theBlu designers are offering all TEDxMonterey participants online credit so you too can add beautiful species and habitats to this globally-connected online ocean. Colleen Flanigan is Trash Tara—a persona she developed to help remind us of the impact of consumer waste on the environment. Meet Trash Tara, explore her awesome costume constructed of post-consumer trash, discuss issues of ocean waste, and help her create the finishing touches on her trash-constructed costume. Joanna Priestley has graciously shared two of her video shorts for TEDxMonterey viewing: ‘Choking Hazard’ and “out of Shape’. Joanna has directed, produced and animated 24 films that explore abstraction, botany, landscape, aging and human rights. She has had retrospectives at MoMA (New York), Center for Contemporary Art (Warsaw, Poland), REDAT (Los Angeles), Stuttgart Animation Festival (Stuttgart, Germany) and the American Cinematheque (Los Angeles) and has received fellowships from Creative Capital, National Endowment for the Arts, American Film Institute, MacDowell Colony, Fundación Valparaíso and Millay Colony. Priestley teaches animation workshops worldwide, was founding president of ASIFA Northwest and has been a member of the Academy of Motion Picture Arts and Sciences since 1992. Her films are available on DVD from www.primopix.com or Microcinema International. Thanks Joanna! The Monterey Bay Aquarium Research Institute presents an interactive demonstration of the impacts of ocean acidification on marine life. See what researchers are learning about how deep-sea ecosystems may change as rising levels of carbon dioxide dissolve in the ocean. Do you ever crave delicious, local fish but are unsure of how to cook it? Do you want to give affordable squid a try but remain intimidated by how to prepare it? Local Catch, Monterey’s own Community Supported Fishery, will demonstrate how to both clean and cook the fish of Monterey Bay. Take the Coastal Economics Quiz to learn how the National Ocean Economics database works, then test your knowledge with a chance to win a prize! Students from the Center for the Blue Economy will quiz you on the National Ocean Economics Program database for coastal economics. Learn and win! Good luck! Enjoy the livestream of the day’s event in the Innovation Lounge throughout the day. 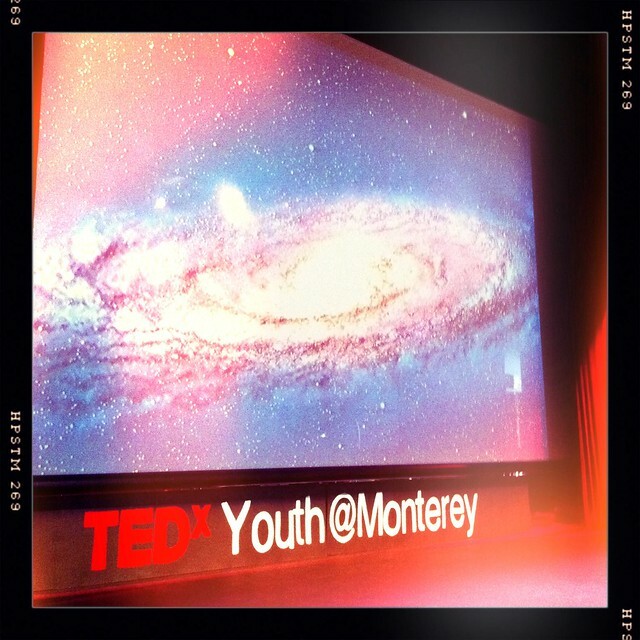 In addition, learn more about grassroots organizing activities for TEDx at the local and regional level with TEDxYouth@Monterey team members Aaron Eden, Tritia MoneyPenny, Beth Scrutton or Bob Cole.